MTP 3200 TETRA Portable Radio - ConnecTel, Inc. The MPT3200 TETRA portable radio has been engineered to ensure excellent audio performance and durability in noisy and demanding environments. 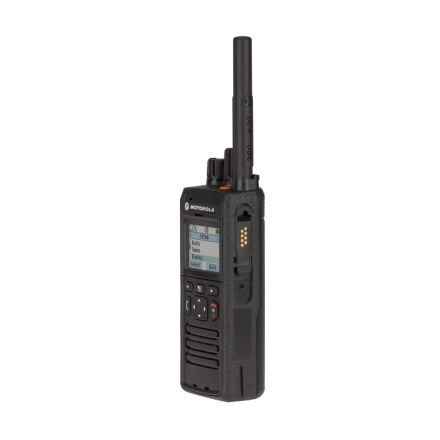 Even for experienced TETRA users this radio is a powerful unit packed with great features such as, Bluetooth connectivity, which enables connection to wireless accessories and companion devices such as scanners and printers. This radio shares the easy to use look and feel of the MPT3100, the MTP3200 is GPS and Bluetooth ready. Furthermore, like all Motorola TETRA radios, MTP3200 has been designed to pass an Accelerated Life Test simulating over 5 years use; these tests ensure it will stand up to the toughest conditions and provide durability that helps to drive down lifecycle support costs. MTP3200 has been made to the highest quality levels and exceeds all 11 categories in the MIL-810 standard. The MPT3200 is the radio you can rely on in demanding situations. The MTP3000 Series radios are the result of more than 15 years of focus in TETRA on increasing user safety, enhancing efficiency and improving communications. The radios are packed with features which are essential for safe and effective operations, as well as significant improvements in areas such as audio and ruggedness. The MTP3000 Series radios have all been enhanced with IP65, IP66 and IP67 for dust and water ingress protection, wideband support for 350-470 MHz and 800 MHz as well as an RFID hardware option. The MTP3100 and MTP3150 are the entry level radios packing in all the TETRA essentials and providing an easy transition from analogue to digital radio. The MTP3200 and MTP3250 add features such as Global Navigation Satellite System (GNSS) capability including BeiDou or Glonass and secure Bluetooth for users who require a feature rich TETRA radio. The new MTP3500 and MTP3550 radios will further enhance the MTP3000 Series delivering a fully featured radio for public safety and mission critical users with the addition of a man down sensor, vibrate alert and End-to-End Encryption (E2EE). The MTP3000 Series is optimised for excellent audio performance in all types of noisy and demanding situations. Audio through both the speaker and accessories is clearer even at full volume, and the user can be heard above loud background noise. Hardware enabled End-to-End Encryption (E2EE) is the most secure method for preventing the interception of critical voice or data communications. High receiver sensitivity and high transmit power gives the MTP3000 Series the capability to maintain communications in the most demanding situations at long range, in built up areas and in buildings. The man down sensor detects whether a radio has been static for a preset time, or has tilted beyond a preset angle. Man down is of particular value for the protection of fire officers in front-line operations, but also lone security personnel or industrial workers operating in hazardous environments. The MTP3000 Series is fitted with two new connectors to provide corrosion resistance, ruggedness, conductivity and low insertion resistance. The side connector has excellent pull strength. The bottom connector has a self cleaning mechanism to resist dust and dirt, is easy to clean, and is protected inside the radios. With IP65, IP66 and IP67 these radios can withstand immersion in a metre of water for 30 minutes, or a high pressure water jet from a fire hose. The two knob interface will suit users migrating from an analogue radio. The wide transflective screen displays additional characters and is easy to see in both low light and direct sunlight. Vibrate alert for incoming calls and messages will allow officers or workers to stay covert or be discreet when silence matter. The MTP3000 Series also come with optional colour identification bands around the antenna. This identifies the radio for user groups with different tasks, coverage area or shifts.